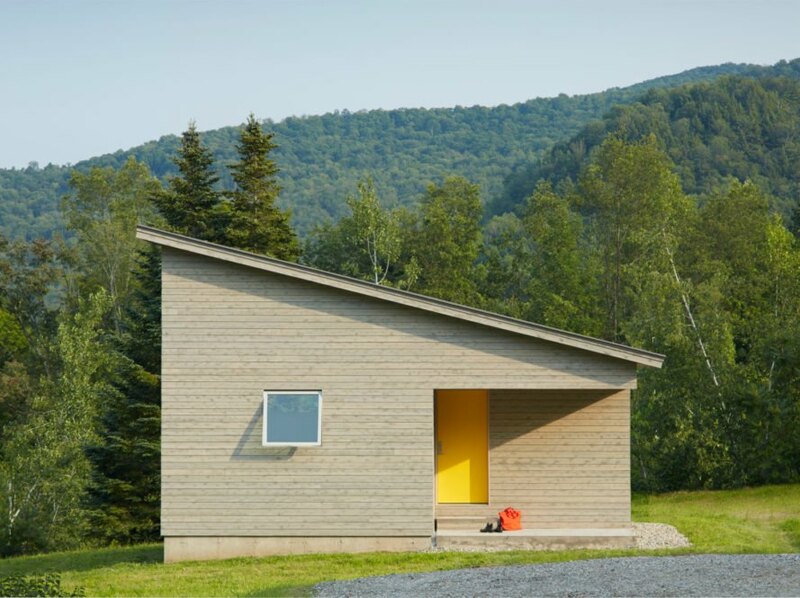 Tucked into a hilly landscape in a remote area of Vermont, a 430-square-foot tiny home holds court among the wildflowers. 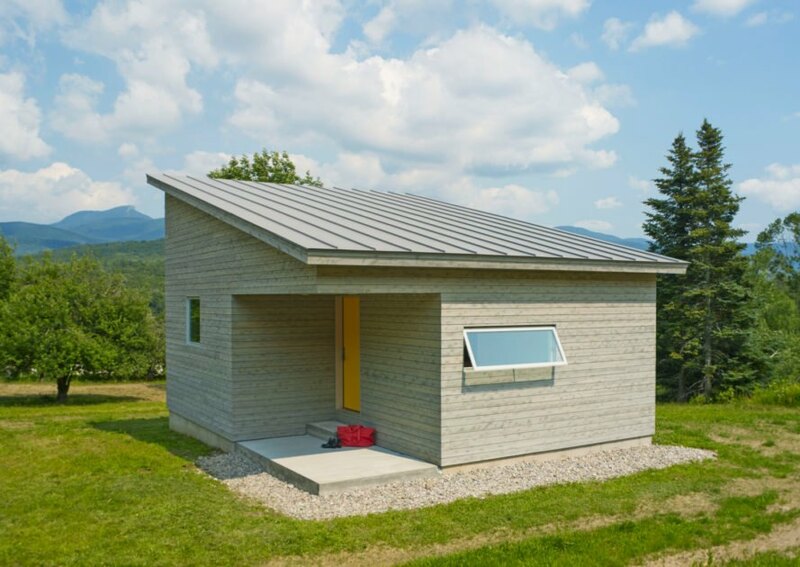 Designed by Vermont-based Elizabeth Herrmann Architecture + Design in collaboration with the artistic homeowner, the cabin-like Micro House is a sophisticated, minimalist structure with a design inspired by the works of Henri Matisse. At just 430 square feet, the volume is quite compact, but sculptural features including sharp angles, a shed roof and large square windows override its tiny presence. Clad in cedar panels stained a light gray, the home has a neutral tone that blends into its natural setting most days but stands out in certain seasons. The sunflower-yellow front door along with a few restrained splashes of color on the interior add a sense of welcoming whimsy to the home. The interior is an open layout, with the living and dining room defined as one space. Various square windows were placed strategically throughout to not only let in light but to frame the stunning views as if they were works of art. The windows were also specifically arranged to optimize natural ventilation and airflow in the warmer months. 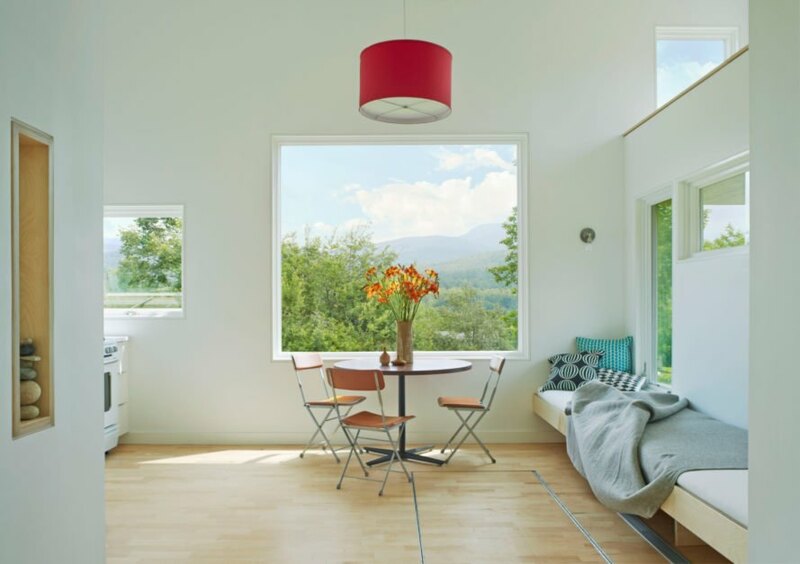 Locally-sourced maple flooring runs throughout the house and complements the all-white walls. 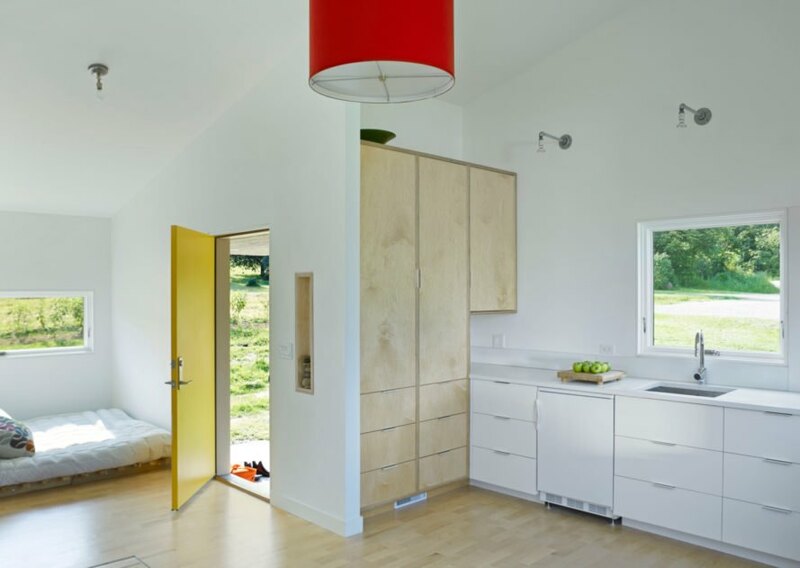 Elizabeth Herrmann Architecture + Design collaborated with an artistic client to create this Micro House. 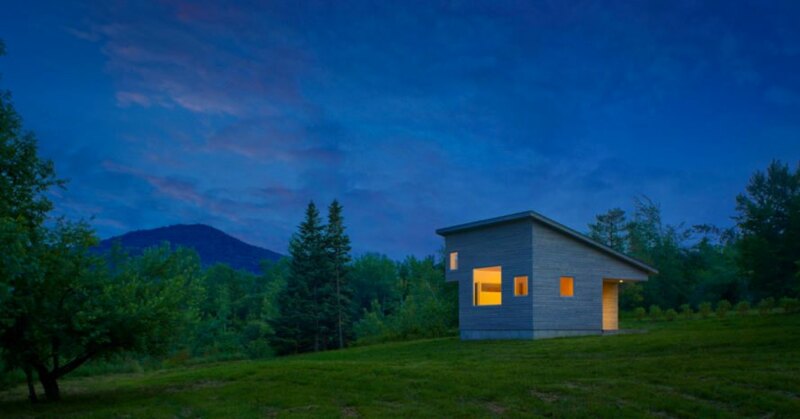 The Micro House is a 430-square-foot tiny home in the woods of Vermont. The design is inspired by Henri Matisse. Simple lines and a neutral color palette lend to a minimalist aesthetic. Strategic pops of color keep an otherwise neutral design from becoming boring. Simple furnishings keep the focus on the outdoors. 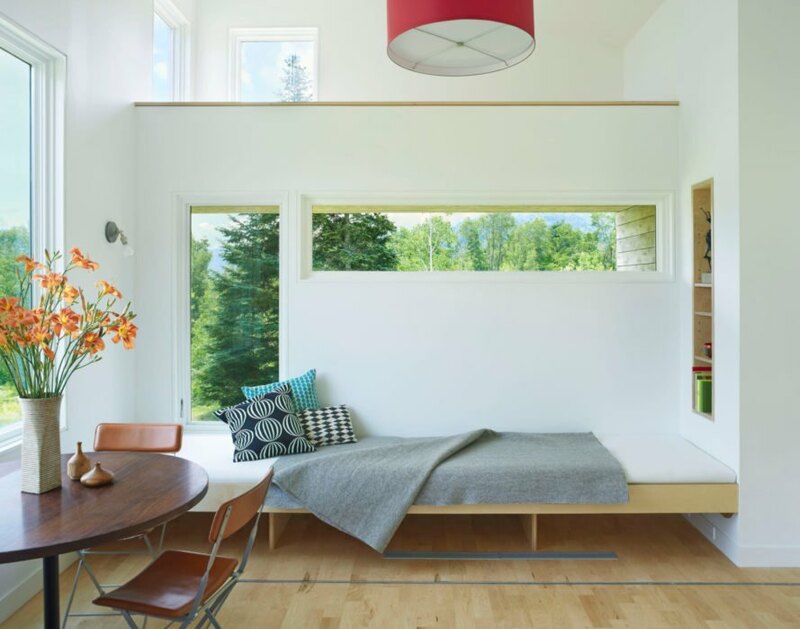 All-white walls and natural light open up the compact space. A large window in the dining area frames the surrounding nature. 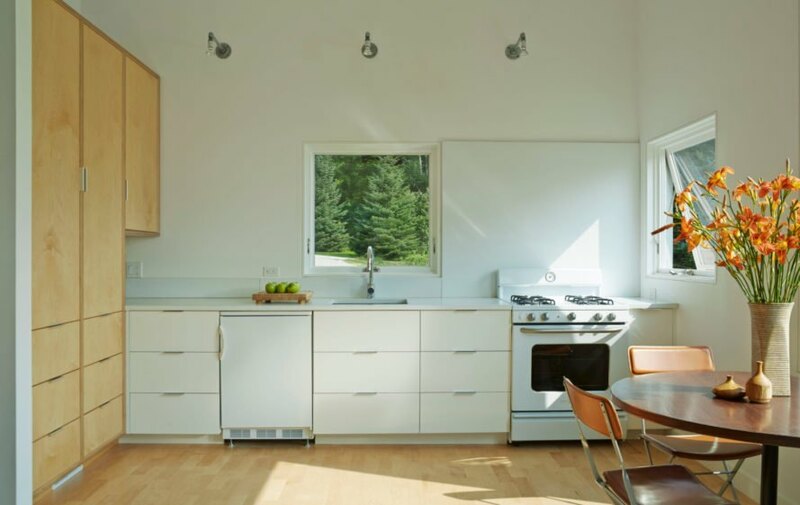 The custom built-in cabinetry was created by Vermont-based Randy Dragon. Geometric angles give the micro home character. Now, the home serves as a cozy retreat and artist's studio.